Laura is glad that she gets to speak with her mother everyday. It at least keeps her from feeling so hopelessly alone. But not having any privacy from her mother’s ghost is beginning to wear on her nerves. She decides that joining a dating service is the only way she will ever meet a man, but lying on the application to make herself appear more fun and outgoing than she really is, is probably one of the worst mistakes of her life. Then one day she nearly runs down her new boss and she freaks because he is too gorgeous to ever truly want her. But will she be ready for the loop she’s about to be thrown for when he starts inviting her out to different places, on dates? Marco can’t understand why the beautiful young woman who nearly barreled over him is treating him so rudely. He was nothing but nice to her and even offered to help her. When he finds out that she is one of his employees, he sets his sights on making her see that he is really a nice guy and very interested in her. After he stumbles on her application for the dating service, with a little help from her mother’s ghost of course, he is prepared to change his way of thinking and doing things to match what she has listed as her favorite things to do and eat. But when he learns that she really hates all those things will he be able to stop himself from falling head over heels in love with her? By far and away a FOUR star book. The relationship between the characters was hilarious and fun-loving. The love took a lot of hits before it could come to blossom, but the roller coaster is the best ride, right? 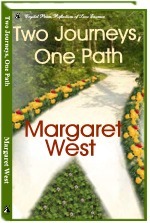 I look forward to more from Margaret West. I’m hooked! Angelina Benton’s dreams always come true, but not always in the way most people wish. After observing her own death in a dream, she is determined not to do anything that may help bring about the dream to reality. But when she meets the handsome man from her dreams, she can’t resist the pull of attraction. It may very well pull her straight to her death. Jared Maxwell never believed in love at first sight, but that was before he met the beautiful Angelina Benton, who just happens to stare at him like he has grown a few extra eyeballs. She seems to be terrified of him and he is determined to find out why. When they become thrown together in a house on the old Slayton Homestead in order to keep their land, he will discover far more than just her secret fear, he will discover that her powers are more than just the power to attract him and so many other men. Especially when it comes to one frightfully real man who has his sights set on Angelina. This first installment of the Visions Trilogy has me pulled so far in I couldn’t dig my way out. I am salivating for more. I need to read the next book more than I need my next breath. 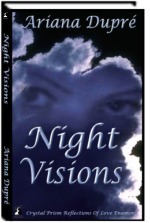 Ariana Dupre has written a mystical story of characters so real they can reach out and grab you. FIVE stars for a lovely story.